Award winning percussionist Ron Reeves was a founding member of Synergy, and performed with the Sydney Symphony and other orchestras in the seventies. He later studied and taught in Indonesia for many years, and also studied Carnatic percussion in South India. Ron has played rock, jazz, world music and more, and represented Australia in World Drum Festivals both here and abroad. He has performed with Bill Cobham, Trilok Gurtu, Hossam Ramzy, Toni Childs, The Supremes, AC/PVC, Karnataka College of Percussion (India), Jugala Group (Indonesia), Lebe Olarinjo Masqueraders (Nigeria) and many more. As well as percussion Ron performs and records on guitar, bass guitar, keyboards, didgeridoo, blues harp, and various flutes and other winds. 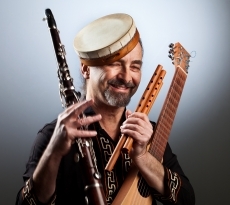 He has recently returned from studying tarogato and furulya (traditional wind instruments) in Hungary.